What to feed kittens dry food or food from the table? Many of us are kept in the homes of cats. Some owners faced with a situation where the kitten you bought it, refuses normal food and only eats ready purchase wet or dry cat food. This is due to the fact that the previous owners fed him only store food. You must wean your pet from this harmful habit, not only because constantly buy is not always cheap food is quite expensive, but also because it may harm the health of the cat. Veterinarians are of the opinion that dry and wet cat food cannot provide all the necessary animal vitamins and minerals, but also harm his health. To accustom a cat to a homemade food in several ways. The most effective of these is the gradual replacement of feed home-made food. To do this in a bowl put pet food, replacing about 10 percent of the usual meal. If you use wet food, it's very easy namyat bread, pasta, potatoes, cereals, etc. If your pet prefers dry food, it is better to prepare special porridge or vegetable puree. The recipe of porridge for the cat is very simple: take chicken necks, feet, bone and the rest meat and sausage cutter, boil and add grits. Gradually increase the amount of homemade food in the bowl and lessen the amount of food. Some cat owners are tired of the whims of the pet resort to more radical methods. In order to accustom the cat to a homemade food, you just need to put him in a bowl is not food, and other food. When an animal is hungry, it will eat what is offered. Other owners, pitying your pet, suggest to offer him instead feed other treats. 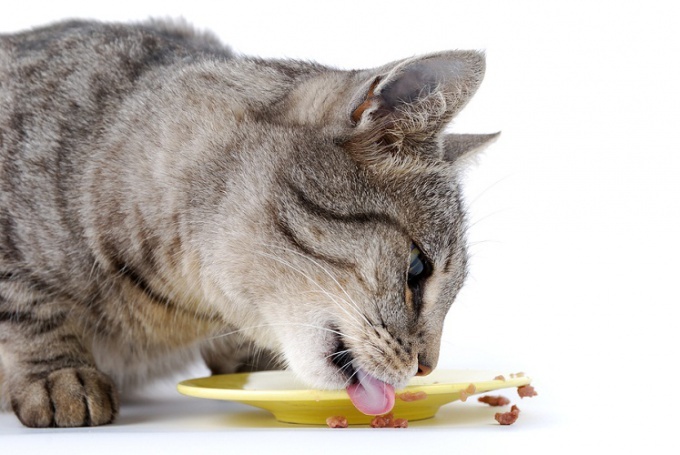 Give your cat a piece of meat or sausage instead of feed him food. The animal is not accustomed to eat only meat, mix it with bread, mashed potatoes, pasta, etc. So you can gradually accustom the cat to homemade treats. To completely abandon the feeding of special foods is not necessary. You can add them to the food to the animal one or two times a week. Indeed, in the special feed still contained some of the vitamins required for your pet, especially in autumn and winter, when to get their homemade products is quite difficult.